With over 60 endemic species Colombia is a must-visit country for birders. This fabulous tour concentrates on endemics in the Magdalena Valley, Guajira Peninsula and Santa Marta Mountains holding some of the most endangered birds in the world including Bogota Rail, Recurve-billed Bushbird and many birds with the prefix Santa Marta: Parakeet, Sabrewing, Blossomcrown, Woodstar, Foliage-gleaner, Bush-tyrant, Brush-finch and Warbler. Day 1 Flight from London to Bogotá where we will transfer to a hotel for the night. Day 2 Today we will visit three very special places close to Bogotá. Our first stop will be La Florida Park where we will look for a number of wetland species including Bogota Rail, Apolinar Wren, Silvery-throated Spinetail, Noble Snipe and Subtropical Doradito. Our second stop will be at the “Jardin Encantado” hummingbird house in San Francisco where we may see up to 16 different species of hummingbirds including Indigo-capped Hummingbird and Gorgeted and White-bellied Woodstars. Finally we will visit Laguna El Tabacal where, in the secondary forest, we will look for Rusty-breasted Antpitta, Rosy Thrush-tanager, Grey-throated Warbler, Stripe-breasted Spinetail and more. At the end of the day we will transfer to Líbano for the night. Day 3 We will visit the coffee plantations and secondary forest around Líbano village in the morning and in the afternoon move on to the dry forest and fields of Laguna del Hato. The long list of interesting birds we will look for today includes Tolima Dove, Yellow-headed and Black-headed Brush-finches, Crested Ant-tanager, Violet-crowned Woodnymph, Andean Emerald, Bronzy Inca, Dwarf and Squirrel Cuckoos, Barred and Moustached Puffbirds, Southern Emerald-toucanet, Azara’s Spinetail, Montane Foliage-gleaner, Bar-crested Antshrike, Golden-winged Manakin, Golden-faced Tyrannulet, Mountain Elaenia, Buff-breasted and Whiskered Wrens, Scrub and Rufous-naped Greenlets, Bay-headed, Crimson-backed, Golden and Plain-coloured Tanagers, Black-winged Saltator, Velvet-fronted Euphonia, Apical, Dusky-capped, Fork-tailed, Panama and Vermilion Flycatchers, Pearl Kite, Common and Ruddy Ground-doves, Yellow-crowned Parrot, Short-tailed and White-collared Swifts, Western Slaty-antshrike, White-fringed Antwren, Jet Antbird, Pale-breasted Thrush, Buff-rumped and Rufous-capped Warblers, White-eared Conebill, Grassland Sparrow, Slate coloured, Ruddy-breasted, Grey and Yellow-bellied Seedeaters and Blue-black Grassquit. In the late afternoon we will transfer to Mariquita Village for the night. Day 4 This morning we will visit the Bellavista Natural Reserve in Victoria municipality, a small but really nice reserve in the Caldas department. In the afternoon, we will transfer to Canon del Rio Claro in Rio Claro Natural Reserve stopping en route for speciality birds. Birds of particular interest we will look for today include White-mantled Barbet, Beautiful Woodpecker, Antioquia Bristle-tyrant, Sooty Ant-tanager, Tody Motmot, Cocoa and Streak-headed Woodcreepers, Red-billed Scythebill, Ochre-bellied and Streaked Flycatchers, Striped and White-bearded Manakins, Golden-hooded Tanager, Streaked and Buff-throated Saltators, Yellow-bellied Seedeater, Black-bellied Whistling-duck, Great and Snowy Egrets, Cocoi and Little Blue Herons, Bare-faced Ibis, Wood Stork, Jabiru, Northern Screamer, Roadside Hawk, Yellow-headed Caracara, American Kestrel, Large-billed Tern, Yellow-chinned Spinetail, White-headed Marsh-tyrant, Pied Water-tyrant and White-winged Swallow. Three nights in Rio Clara Nature Reserve. Days 5–6 We will spend both days in the Rio Claro Natural Reserve where we will enjoy the incredible humid tropical forest with its amazing biodiversity. Possible birds in this habitat include Colombian Chachalaca, Citron-throated Toucan, Black-bellied and Rufous Wrens, Black-headed Tody-flycatcher, Marbled Wood-quail, Chestnut-backed and Dull-mantled Antbirds, Stripe-throated Hermit, Ruby Topaz, Purple-crowned Fairy, White-tailed Trogon, Pied and White-whiskered Puffbirds, Cinnamon Woodpecker, Pacific Antwren, Brown-capped Tyrannulet, Southern Bentbill, Long-tailed Tyrant, Rufous Piha, Blue Cotinga, Yellow-browed Shrike-vireo, Black-chested Jay, Golden-hooded, Scarlet-browed and Scrub Tanagers, White-eared Conebill, Slate-coloured Seedeater, Large-billed and Thick-billed Seed-finches, Masked Yellowthroat, Orange-crowned Oriole and Fulvous-vented Euphonia. 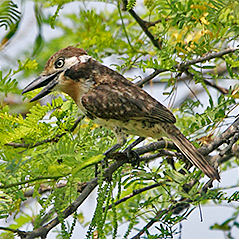 One afternoon we will visit Hacienda Napoles (also humid tropical forest) where we may add some species including Black-billed Flycatcher, Black Antshrike and Bare-crowned Antbird. Day 7 We will move on this morning to San Vicente de Chucuri Town, a small town in the mountains where the Cerulean Warbler Reserve is located. This is a great reserve established to protect migratory birds as well as other endemic and endangered species. We will stop for birding en route to search for the near-endemic Northern Screamer and in the afternoon change to 4x4 vehicles to climb up to the reserve. Two nights in the Cerulean Warbler Reserve. Day 8 The whole day will be spent in the Cerulean Warbler Reserve in the Yariguies National Natural Park searching for a number of speciality birds including Gorgeted Wood-quail, Black Inca, Parker’s Antbird, Long-tailed and Upper Magdalena Tapaculos, Colombia Mountain Grackle, Andean Emerald, Highland Tinamou, Red-headed Barbet, Crimson-rumped Toucanet, Spotted Barbtail, Ochre-breasted and White-bellied Antpittas, White-throated and Yellow-throated Spadebills, Green-and-black Fruiteater, Pavonine Cuckoo, Golden-winged Manakin and Rufous-naped Brush-finch (new ssp yarigierum). Day 9 In the morning we will bird around the coffee plantations of the reserve before moving on to Ocaña municipality, close to the Bushbird reserve. Birds we will look for in the reserve include Rough-legged Tyrannulet, Band-backed and Bicoloured Wrens, Chestnut-bellied Hummingbird, Turquoise Dacnis, Niceforo´s Wren and, of course the near-mythical, Recurve-billed Bushbird. Three nights in Ocaña. Day 10 We will spend all day in the bamboo and secondary forest of the Bushbird Reserve. The target bird will of course be Recurve-billed Bushbird but there are many other species present here including Streaked Spinetail, Black-fronted Wood-quail, Lined Quail-dove, Long-tailed Antbird, Orange-billed Nightingale-thrush, Chestnut-capped and Moustached Brush-finches, White-bibbed Manakin, Band-tailed Guan, Lazuline Sabrewing, Black-headed, Burnished-buff and Speckled Tanagers, Chestnut-bellied and Yellow-legged Thrushes, Yellow-bellied Siskin and Cliff Flycatcher. Day 11 Today we will drive to El Cauca to look for the enigmatic Todd´s race of Painted Parakeet. Other birds to be found in this dry area include Golden-winged Sparrow, Lance-tailed Manakin, Ruby Topaz, Red-legged Honeycreeper, Black-faced Dacnis, Black-faced Tanager, Rufous-and-white Wren, Curve-billed Scythebill, Pearly-vented Tody-tyrant and White-whiskered Spinetail. Day 12 We will make an early-morning transfer to Santa Marta stopping en route in dry forest to search for some interesting birds including Crested Bobwhite, Double-striped Thick-knee, Stripe-backed Wren and Hooded Tanager. Red Siskin has been reported in the area but recent records are unverified. After arriving in Santa Marta, we will transfer to Guajira for the night. Day 13 This morning we will visit the Los Flamencos National Park before returning to Santa Marta again in the afternoon. We can add many species to our lists in this dry thorn-scrub habitat including Chestnut-winged Chachalaca, Pale-breasted and White-whiskered Spinetails, Vermilion Cardinal, Harris’s Hawk, Common Black-hawk, Aplomado Falcon, American Kestrel, Ferruginous Pygmy-owl, Bare-eyed Pigeon, Brown-throated and Blue-crowned Parakeets, Green-rumped Parrotlet, Burrowing Owl, Red-billed Emerald, Buffy Hummingbird, Rufous-tailed Jacamar, Whooping Motmot, Russet-throated Puffbird, Chestnut Piculet, Red-crowned Woodpecker, Straight-billed Woodcreeper, Caribbean Hornero, Black-crested and Black-backed Antshrikes, White-fringed Antwren, Northern Scrub-flycatcher, Southern Beardless-tyrannulet, Slender-billed Tyrannulet, Pale-eyed Pygmy-tyrant, Pearly-vented Tody-tyrant, Brown-crested, Social, Streaked and Venezuelan Flycatchers, Bicolored Wren, Tropical Gnatcatcher, Tropical Mockingbird, Blue-grey and Glaucous Tanagers, Tocuyo Sparrow, Black-faced Grassquit, Pileated Finch, Greyish and Orinocan Saltators, Saffron Finch and Yellow Oriole. At the end of the day we will transfer to Minca for the night. Days 14–15 We will explore the beautiful humid tropical forest around Minca in the morning then transfer to El Dorado Lodge in Sierra Nevada de Santa Marta Mountains in the afternoon. Despite having been in Colombia for two weeks, today is likely to be filled with new birds. Possibilities include the endemics Santa Marta Screech-owl, Santa Marta Sabrewing, Santa Marta Woodstar, Santa Marta Parakeet, Santa Marta Blossomcrown, Santa Marta Foliage-gleaner, Santa Marta Bush-tyrant, Santa Marta Wood-wren, Santa Marta Brush-finch and Black-cheeked Mountain-tanager, as well as Black Hawk-eagle, Military Macaw, Scarlet-fronted and Orange-chinned Parakeets, Red-billed Parrot, Black-fronted Wood-quail, White-tipped Dove, White-collared and Chestnut-collared Swifts, Blue-fronted Lancebill, Brown and Lesser Violetears, Coppery Emerald, White-vented Plumeleteer, Steely-vented Hummingbird, Collared Aracari, Keel-billed Toucan, Golden-olive, Lineated and Crimson-crested Woodpeckers, Black-backed Antshrike, Greenish and Forest Elaenia, Yellow-olive, Piratic and Yellow-breasted (Ochre-lored) Flycatchers, Cinereous, Cinnamon and White-winged Becards, Masked Tityra, Rufous-breasted Wren, Black-hooded and Black-billed Thrushes, Golden-fronted Greenlet, Brown-capped Vireo, Purple Honeycreeper, Blue Dacnis, Rusty Flowerpiercer, Bay-headed, Black-headed, Black-capped, Palm, White-lined and Crimson-backed Tanagers, Yellow-backed Oriole, Crested Oropendola and Thick-billed Euphonia. During the northern winter months these foothills harbour a good number of North American breeding migrants including Swainson’s Thrush, Yellow-throated Vireo, Tennessee, Golden-winged, Cerulean, Blackburnian, and Black-throated Green Warblers, Rose-breasted Grosbeak and Summer Tanager. Two nights at El Dorado Lodge. Day 16 We will visit the medium and low areas of the Santa Marta Mountains then, in the afternoon, transfer to Santa Marta to take a flight to Bogotá. Overnight in Bogotá. Day 17 Morning flight back to London arriving in the early morning of Day 18. General Information Colombia can be hot and humid at this time of year so we will spend a lot of time birding in the early morning and evening and spend the middle of the day, when bird activity is relatively low, either back at the hotel/lodge or transferring between sites. There are some health requirements so please consult your doctor. Only a general degree of fitness is required, although the heat and humidity can be tiring at times. Security is not a problem and we will travel only to areas approved by the British Foreign Office. Visas are required. Group SizeMinimum number for tour to go ahead: 5; maximum group size: 10 with 2 leaders. Price includes scheduled economy return flights between London and Bogota, internal flights, all ground transport within Colombia, accommodation in twin-bedded rooms in medium quality hotels or lodges (not all en-suite), all meals, reserves entrance fees and services of the leader throughout. Excluded are insurance, visas, drinks, tips and items of a purely personal nature.